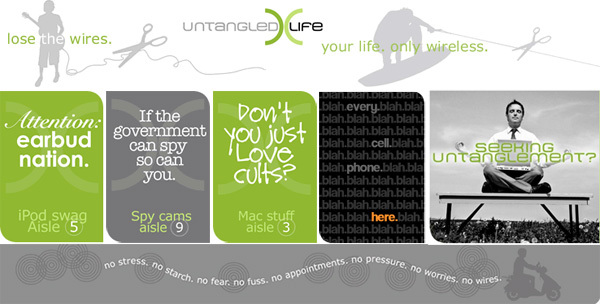 My obsession of the day is Untangled Life… and their Wibrary (think wireless library?) - and as much as i hate to admit it - their visuals won me over first. Their ads/etc are hilarious, and gorgeous. And like a proper one - two punch, next thing that hit me was their brilliant concept - UNTANGLED LIFE - the title says it all on so many levels, they are simplifying your life, they offer free tech support (totally sending my mom to these guys), 5$ handling + free shipping, and they provide all things wireless. Its like a dream store, i would even go so far as to say, when these guys put a physical store together, it will blow the apple store away. A prehistoric camper, an orange battle, technicolor business cards, teenage-pest-control and a future camper! This week curated for you by Hello-Friend… more .orging goodness over at NOTCOT.org… we’re waiting for your contributions! On that note - Plea For Help! I’m going to start freelance writing/blogging for another site covering Tech/Gadget Blogs [and pet blogs too] - and would love to hear what sites you guys love and know about that deserve some recognition! I’ll post more info up here when it gets going, so far, it seems like a really fun venture NOTCOT lovers might enjoy… i’ll keep you posted. I’m sure you’ve seen these dog/cat dishes around - they were featured as one of I.D. Mag’s “Most Intriguing designs of 2005”! Well these caught my eye a while back, and they almost make me want to get a puppy more, simply for an excuse to buy them - especially with this crazy 48% off for ONLY 48 hours starting at 12:01 eastern time, June 14th, 2006. So check out Susan Kralovec’s Everyday Studio. I just found this set of free postcards i forgot i had slipped into my bag in London - Beetle Art! Apparently in the UK, VW has released a set of 4 vinyl sticker sets from 4 top artists. They start at 45 pounds for a single panel, to 200 pounds for the entire car. You can mix and match color combinations and models over at the site. I personally like the birds the best out of the four, but not sure if i could imagine having it on my car - but the concept is quite fun. I always remember Vanuatu as that crazy country with the really fun stamps when i was little. Well oO posted some great links over at .org - they actually have an underwater post office, as well as a mailbox on the edge of a volcano! I’m ready to try to make my next dive trip to Vanuatu just so that i can write a letter on waterproof paper (like what nalgene had) with my waterproof pen, and mail it in a waterproof envelope from under the sea. We all know that this time of year, footballers are gods. World Cup takes over television, radio, and almost any store you walk into (unless you’re in the US, but we will ignore that). So why not immortalize them as they did back in the day? In ceiling filling, larger than life murals? 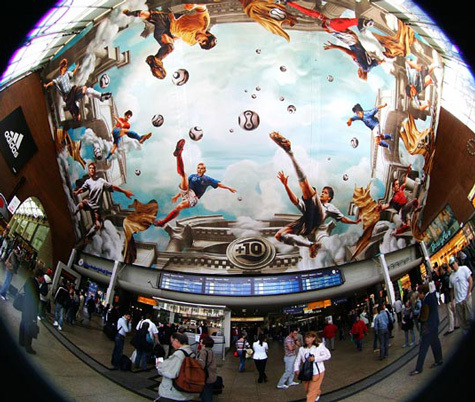 … so its in a train station instead of a church, but that is a place where followers of the football pass through to reach the stadiums, where they worship the players, no? Via the CoolHunter is this ceiling of Hauptbahnhof train stain in Cologne, Germany. Wow. Ok, for all you pilates, yoga, and anti-slip-and-slide aficionados - Yogitoes are for you. I posted about them previously. Well, we’ve been test-driving them here the last few months (and you will see them again in our premier photoshoot, which i will be launching very very soon!) - courtesy of the folks at Yogitoes… and i can’t imagine life without them! My ultimate test was if i put it down on the wood floor in the hallway and took a running start, would i slide all the way down? (in socks i can) - well believe it or not, it barely budged. When it comes to yoga and pilates, you do sweat, and it is gross to have to either a) sweaty towel sliding around on mats of b) mat with built in cloth top, which is hard to wash. Also throw in wanting a way to not have to carry the yoga mat around (travel, last minute decision to go to class) - and you can just use this Yogitoes’ Skidless over the mats available at the gym! Unless you like looking special carrying that oversized yoga-mat around… So its been perfect for travelling, and perhaps it would even be perfect if you were to lay out on some super smooth slanted surface for a while… afterall with those magical rubbery nobs, your Skidless can be as versatile as you are creative. 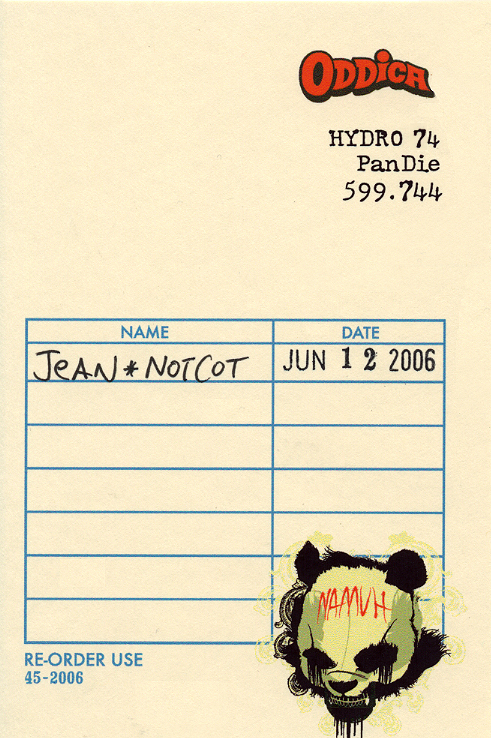 The Library Card functions on a few other levels — it let’s us promote the Artist, and let’s us connect with the customer on an old-fashioned level. If we ever get too big that we cannot find the time to handwrite the customer name, then we know we have gone astray. Also, the Dewey Decimal numbers, we locate numbers that correspond to the particular design. Like for the Undertaker, I think we did Cemeteries, English, or something. Mystery solved. And it highlights the brilliance and attention to detail that is put into every bit of all things Oddica - so go take a look at the new shirts and sweatshirts, and if you order one, you get a sweet library card too! 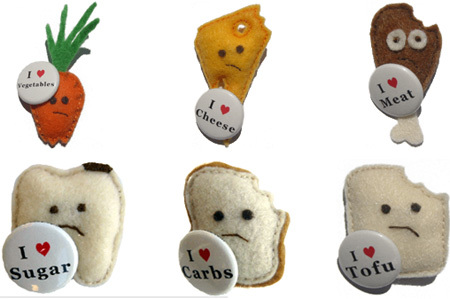 Stitches posted these great IRKED Pin Cushions to .org! And the concept and execution were really fun, and seemed like a good sunday post. Usually, i imagine pin cushins with lots of straight pins sticking out like the pricks of a porcupine… i feel a little silly not having thought of how much fun pin cushions for 1” buttons could be! From the Button Arcade. Hydrate or Die! Liking this graphic on the new CamelBak spillproof bottle with the “Big Bite Valve” designed with no moving parts, where you simply bite and sip, no need to even tip it. And they say it even fits most cup holders (which is making me wonder if my new car is in need of a new water bottle… hmm.) They claim it won’t spill even if held upside down in the open position! If you’ve tried this, let me know? Researching water bottle options - just noticed this Nalgene Flask - since when did Nalgene make flasks?!?! Contains 12 ounces (350 ml), one-ounce cap, includes durable insulation sleeve, and prevents plastic taste and odor while being leakproof for traveling.